A fascinating mix of urban life and outdoor activities, Sydney is packed with fantastic things to do and places to visit. From climbing and walking its bridges to skydiving for the more adventurous, this vibrant city in eastern Australia has something for everyone. Sydney is such a spectacular harbour city with so many unique and interesting things to see and do. 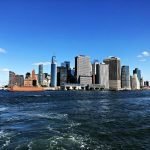 As a Sydney local here are my top 15 recommendations of must-do activities in Sydney for first-time visitors. If you are only in Sydney for a limited time then one of the best places to visit and explore is Circular Quay. Circular Quay is a transport hub with buses, trains and ferries all departing from here. From Circular Quay you also obtain brilliant views of the Sydney Opera House, the Sydney Harbour Bridge and the spectacular harbour itself. This is a fantastic photo location. The Museum of Contemporary Art is also located in this area. Their rooftop bar, MCA Cafe Sculpture Terrace, is the perfect spot for a relaxing drink and reasonably priced meal whilst enjoying some of the best views of Sydney away from the crowds below. Most tourists don’t know about this rooftop bar and miss out on the amazing views from this venue. If you are wanting to indulge in a more sophisticated cocktail menu whilst marvelling at panoramic vistas of Sydney Harbour then visit Blu Bar On 36, on the, you guessed it, 36th floor of the Shangri-la Hotel. This isn’t a cheap venue but the views and drinks are well worth the splurge. Note: If you are planning to use public transport in Sydney make sure you buy an Opal card. Opal is the smart card ticketing system used to pay for travel on public transport in Sydney, the Blue Mountains, Central Coast, the Hunter & the Illawarra. You add value to the card and then tap on and off to pay your fare. The benefits of using an Opal card include cheaper fares, and daily and weekly fare caps. » Insider Tip: Buy the iVenture Sydney Pass to access a great selection of attractions and enjoy discounts on other activities. Depending on your budget I recommend either climbing the Sydney Harbour Bridge, visiting the Pylon Lookout or at least walking along the bridge. The cost of climbing the bridge varies depending on the time of day and week you choose to climb. Prices for adults range from $170 to $390 (AUD). 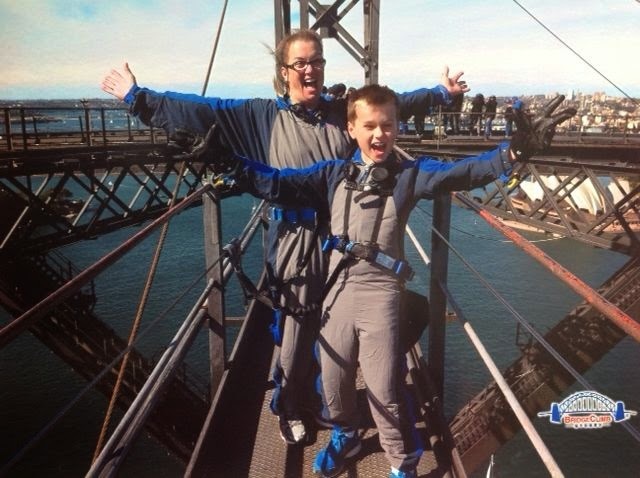 I climbed the bridge with my then 12 year old son. You are not allowed to take your own camera on the climb with you but the guides will take spectacular photos of you on the bridge. The view from the top of the Sydney Harbour Bridge is simply unbeatable! The whole bridge climb experience is amazing and you learn a lot about the history of the bridge during the climb. If you are on a tight budget you can visit the Pylon Lookout of the bridge for $15 as an alternative to the bridge climb itself. An even cheaper alternative is to simply walk across the bridge for free. You still get panoramic views of the harbour with these two cheaper options. A visit to the weekend Rocks Markets is another must-do activity. The market is open air with stalls located under large umbrellas in Playfair St, George St & Jack Mundey Place in The Rocks. They are located along cobblestone streets amid historic sandstone buildings. There are numerous pubs and cafes you can pop into along the way too. The Argyle in The Rocks is one of Australia’s oldest buildings and now a fabulous dining and nightlife venue. It is an iconic rocks hot spot for locals and visitors. It consists of six bars over two levels and an outdoor courtyard area. It is well worth a visit, especially in the evening. I also recommend visiting The Glenmore Hotel in Cumberland St for their rooftop bar with views of the Sydney Opera House and Circular Quay. Arrive early for the best seats and enjoy a leisurely schooner of beer and chicken schnitzel. Items for sale at The Rocks markets include locally designed fashion, jewellery and home wares, souvenirs and Australian gourmet street food. On my last visit to The Rocks Markets I ate delicious lamb, kangaroo and octopus skewers with mouth watering homemade artisan chocolates for dessert. I regularly buy gifts for overseas friends and relatives from the Rocks Markets. You can check out all the stalls at these markets here. Sydney is renowned for its beaches and the best thing about visiting a beach is that is a fun and completely free activity. 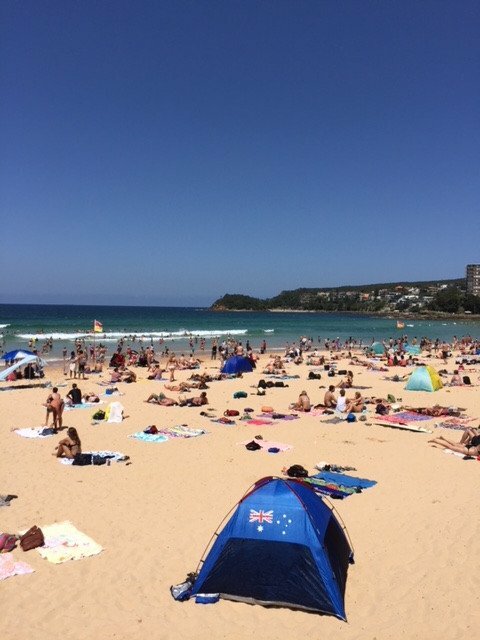 I live in Sydney’s Northern Beaches area and recommend Manly beach, child friendly Shelley beach, Freshwater beach or Palm Beach where Home and Away is filmed and where all the celebrities holiday during the Summer. There are numerous restaurants and cafes along both the Manly beachfront and Manly Wharf. I recommend Hugos Manly Restaurant on iconic Manly Wharf for their fresh contemporary Italian cuisine with sophisticated cocktails. On the Eastern side of the harbour a visit to iconic Bondi Beach is also a must but be warned this beach does get very crowded. For eating in Bondi the most iconic venue is Icebergs Dining Room and Bar. Once again it has an Italian cuisine. I recommend choosing one of their seafood dishes. Due to Sydney’s location, the sun is extremely powerful here and it is easy to become sunburnt very quickly especially in summer. Make sure to use adequate quantities of sunscreen to protect yourself. Surfing is an iconic sport in Sydney and what better location to learn to surf than at Manly Beach! Manly Surf School offers both group and private individual lessons for all levels of surfers including absolute beginners. This is such a fun experience. Wet suits and surfboards are provided. By the end of their first lesson, my three children were all managing to get on their feet on the surfboard. The Sydney Opera House is an instantly recognisable architectural icon of Sydney. Make sure to indulge in some culture watching a live show at the Opera House, take a backstage tour of the Sydney Opera House or at least walk around the outside of the building and take a selfie on the stairs with the majestic Sydney Opera House sails in the background. You can enter the foyer of the Opera House and have a browse around for free whenever the Box Office is open. There are various eateries available in and around the Opera House. The most exclusive is the formal dining Bennelong Restaurant. The Outdoor Opera Bar is more economical and a favourite place of mine to enjoy a drink and meal whilst watching the sun set behind the Sydney Harbour Bridge. In the evenings there is live music in the bar. Catching a ferry to Watson’s Bay is one of the great things to do in Sydney. 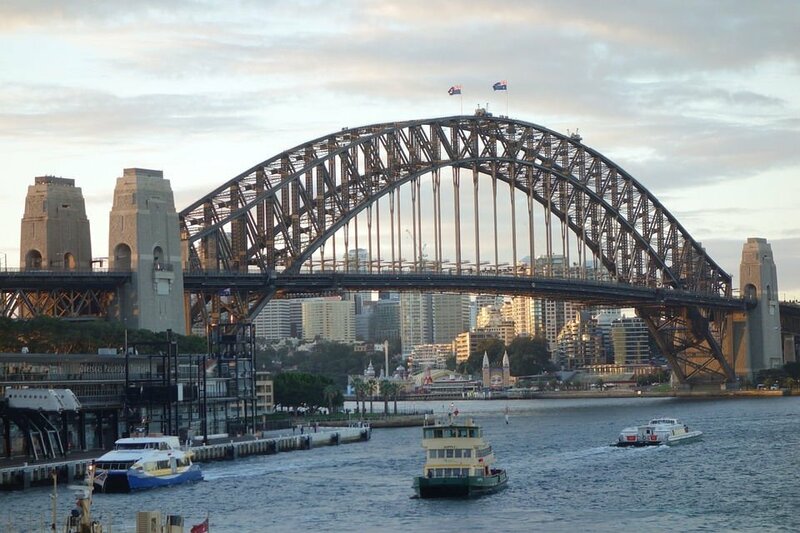 A trip on a Sydney ferry is a must, especially for first time visitors to Sydney! There is no better way to view the stunning harbour than from on the water itself. I recommend taking a ferry trip to nearby Watson’s Bay for a fresh seafood lunch of fish and chips. Darling Harbour is a vibrant food and entertainment precinct with great outdoor playgrounds including a flying fox and rope climbing frame for children. There is also a beautiful historic carousel. Darling Harbour is a 10 minute walk from the centre of the city or a quick ferry ride from Circular Quay. At Darling Harbour you can take a ride on the gigantic Star of the Show Ferris Wheel to enjoy stunning views of this harbour precinct. Sea Life Sydney Aquarium, Wildlife Park, Madame Tussaud’s and the Chinese Garden of Friendship are all located in Darling Harbour also. There are often fabulous, fun, free activities in Darling Harbour especially during the school and Summer holiday periods. There are also numerous waterside restaurants and cafes to choose from on both the Cockle Bay side and Harbourside of Darling Harbour. There is a food court inside the Harbourside shopping centre for cheaper eats. Visiting Taronga zoo and learning about their wildlife conservation projects is one of the things to do in Sydney. Australia has numerous unique animals such as koalas, kangaroos, emus, wallabies, wombats, bilbies and platypus that are found no where else in the world. 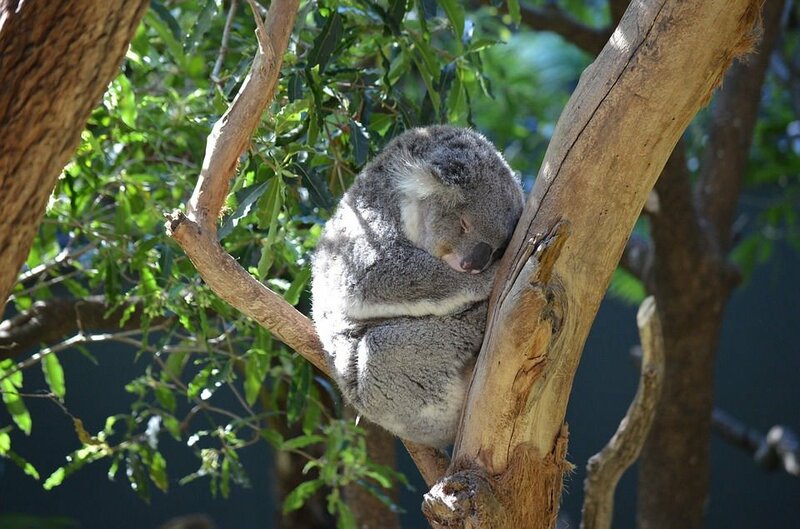 Visit Sydney’s Taronga Zoo to see these Australian animals plus more. Taronga Zoo is a quick 12 minute ferry trip from Circular Quay. The zoo is located on Sydney Harbour in a natural bushland setting. You can get close up photos of kangaroos, wallabies and emus in the Australian animal enclosure area and you can pay an additional amount for an up close encounter with a koala. You can also take amazing photos of the city from the zoo. Once you’ve paid the zoo admission you can catch the free Sky Safari cable car inside the zoo to get a bird’s eye view of the zoo and the city. Buy your Taronga Zoo tickets online to save on the entrance fee. This is a scenic 10 kilometre walk through a mix of bushland and harbourside coastal tracks. You can stop to have a swim along the way at various bays you pass. You can start the walk at either end but I recommend commencing it from The Spit Bridge end and walking to Manly, especially if you are staying in the city. Catch a M30 or 143 bus to The Spit Bridge from the city to start. Upon arrival in Manly, you can indulge in a well deserved drink, snack or meal before catching the ferry back into the city. From May to November, you may even see some migrating whales along your walk. This walk takes about three to four hours hours depending on your walking pace. You need medium levels of fitness for this walk. An easier and shorter walk with equally wonderful coastal views of the ocean and sandstone cliffs is the Bondi to Bronte walk. This walk is only 1 kilometre long and is suitable for young children. There is a playground at Bronte where they can play at the end of the walk. Bring your swim suits at have a dip along the way. This is Sydney’s most photographed and iconic ocean pool located at Bondi Beach. It is well worth a visit and swim in this 50 metre salt water pool. Afterwards, visit the Icebergs Dining Room and Bar. The view is spectacular and the Italian food is delicious. I especially recommend the seafood. This is also a great location for people watching. Visit Sydney’s tallest free standing building and take the lift ride to the top to see the best 360 degree views of the CBD from the indoor observation deck 250 metres above the city streets. All tickets to the Sydney Tower Eye include both the Observation Deck and a 4D Cinema experience. There are complimentary binoculars and telescopes to view the Sydney landmarks with if desired. There is also an outdoor SkyWalk available at an extra cost to view the city below through a glass walkway. A day trip to the Blue Mountains is a great day trip from Sydney. The Blue Mountains is a must see day trip from Sydney. It is easy to catch a train from Central to the Blue Mountains. Make sure to visit Echo Point for panoramic valley views and the unique Three Sisters rock formation. 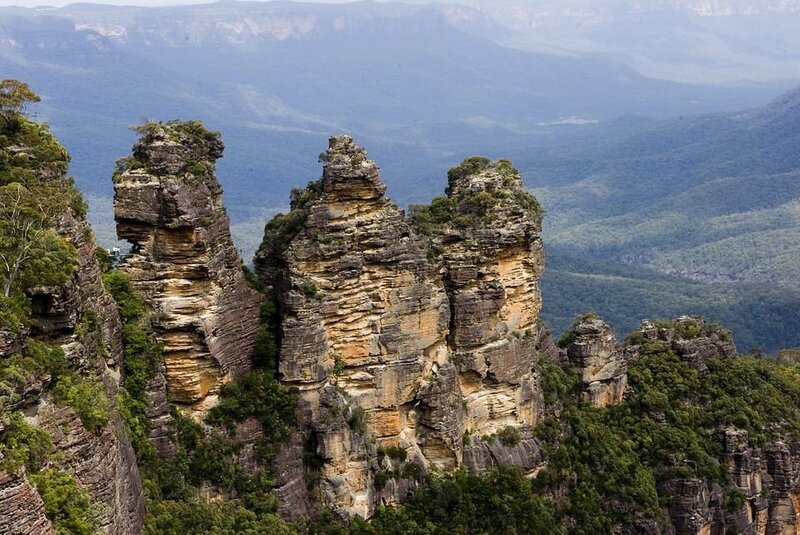 Numerous bush walks, both short and long with varying degrees of difficulty, are available in the Blue Mountains. Blue Mountains Scenic World offers sky way, walk way, railway and cable car rides. The Scenic Railway is the steepest incline railway in the world. Afterwards, visit picturesque Leura for a leisurely afternoon tea and to browse the various antique shops and galleries. Leura Cascades waterfall is also worth a visit whilst in the Blue Mountains. » Insider Tip: To better enjoy the Blue Mountains, book an all-inclusive tour. For the more adventurous I recommend a sky dive to see a bird’s eye view of the countryside surrounding Sydney. 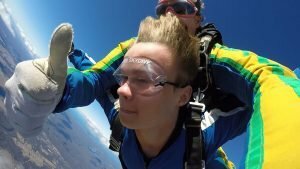 The closest sky diving location to Sydney is at 1300 Skydive in Picton. The company we did it with picked us up from a central Sydney location and drove us to Picton 1 and 1/2 hours away. Tandem sky dives were available. A small plane took us up to 14,000 feet where you then jump. The view is breath taking! You can see the city in the distance on one side and the Blue Mountains on the other side. Video and photo packages of your sky dive were available to purchase. The minimum jumping age is 12 years. 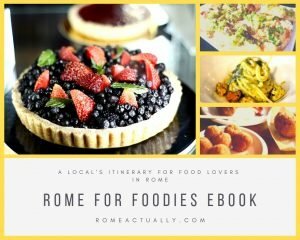 Author bio: This guest post was written by long time Sydney resident Ingrid who loves showing overseas and out of town visitors around her city, and is also the editor of Fabulous and Fun Life, a Sydney beauty blog. Ingrid also curates a Sydney food Instagram account showcasing Sydney food, called Sydney Food Bites.